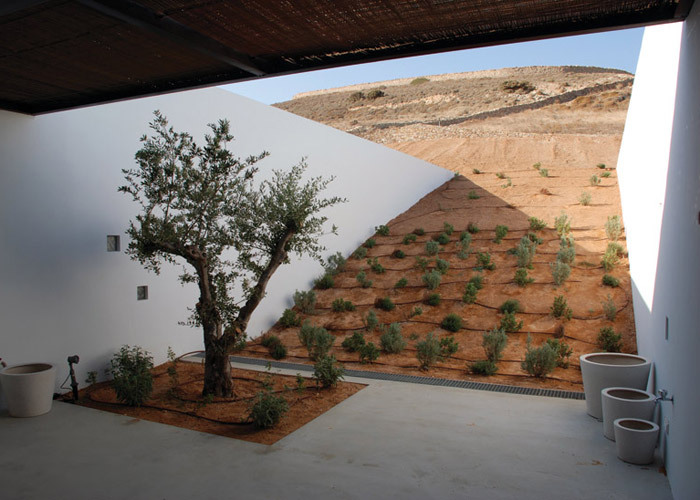 This stunning underground home by Deca Architecture utilizes a natural palette of materials to maintain a low profile while complementing the serene Mediterranean landscape that surrounds it. 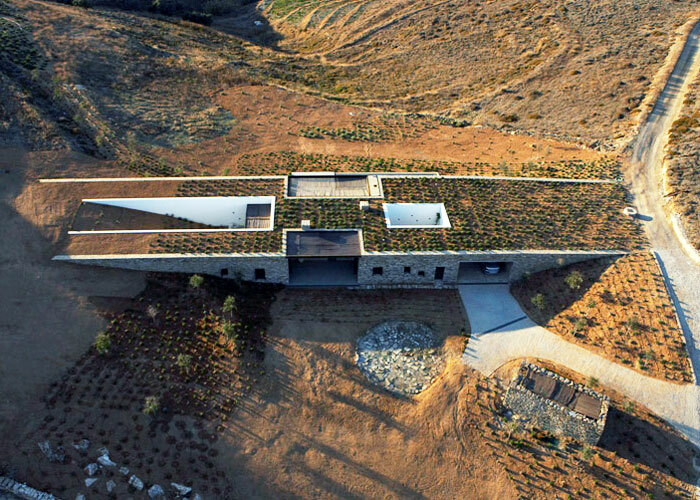 Situated in a small valley with views of the coast, the Aloni house consists of two stone walls bridged by a beautiful green roof that spans two adjacent slopes. Spotted on Designboom, the home takes advantage of rustic materials that maximize energy efficiency while allowing the house to blend in with the rugged terrain of Greece's Antiparos Island. The Aloni house finds its inspiration in the landscape of the Cycladic Islands, which were shaped in the past by earthen retaining walls erected to create land fit for farming. Deca Architecture decided to incorporate this traditional building typology into the design of the house, and the result is a structure that resonates with the topography of its site while taking advantage of low-impact materials that impart high insulation values. The single-level 240 square meter home features walls made of retained earth that regulate the interior temperature thanks to their high thermal mass, while a green roof provides further insulation from the bright Mediterranean sun. The Aloni home’s plan consists of five interior areas surround by four courtyards that are ,a href=”https://www.inhabitat.com/2010/04/06/soeul-gains-an-underground-house-by-byoung-soo-cho/”>carved into the landscape. The interior spaces feature large windows that allow daylight to spill into the home, while shades and overhangs protect the home from inclement weather and excessive solar heat gain. According to the architects, Aloni refers to “the remains of a crop-harvesting circle that was found and preserved as part of the agricultural past of the site“. We love how the architects used traditional building techniques to create a modern and efficient home that preserves its roots through a sense of site-specific history. The project won the Piranesi Award in 2009. The Aloni house finds its inspiration in the landscape of the Cycladic Islands, which were shaped in the past by earthen retaining walls erected to create land fit for farming. Deca Architecture decided to incorporate this traditional building typology into the design of the house, and the result is a structure that resonates with the topography of its site while taking advantage of low-impact materials that impart high insulation values. The single-level 240 square meter home features walls made of retained earth that regulate the interior temperature thanks to their high thermal mass. 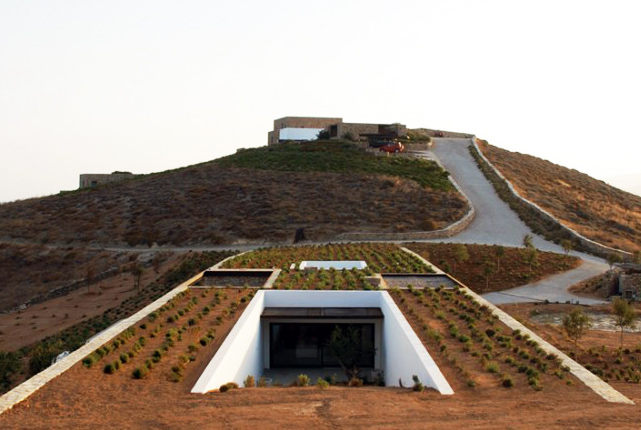 A green roof provides further insulation from the bright Mediterranean sun. The Aloni home's plan consists of five interior areas surround by four courtyards that are ,a href="https://www.inhabitat.com/2010/04/06/soeul-gains-an-underground-house-by-byoung-soo-cho/">carved into the landscape. The interior spaces feature large windows that allow daylight to spill into the home, while shades and overhangs protect the home from inclement weather and excessive solar heat gain. According to the architects, Aloni refers to "the remains of a crop-harvesting circle that was found and preserved as part of the agricultural past of the site". We love how the architects used traditional building techniques to create a modern and efficient home that preserves its roots through a sense of site-specific history. A cross-section diagram of the Aloni House. A topographical diagram of the Alioni house. The project won the Piranesi Award in 2009.